Anyone else notice that nobody is complaining about anything anymore? Let me be more specific. While Washington is more shrill than ever, we here in Buffalo and Western New York seem to be more sedate. We’ve followed Jules’ advice and chilled this mother out. Not hope (false or not) for the future, but not resignation and apathetic despair either. Just . . . even keel. Whether this break is a lull, a calm before the storm, or more long lasting is impossible to know. But locally, nobody seems to be too riled up, and this is in stark contrast to the last decade. Maybe it’s because the lightning rod projects have finally drawn towards a conclusion. Mark Croce, by all accounts, is pouring real money into the Statler and bringing it back. That was the last item in the Silver Bullet checklist of Buffalo. The Peace Bridge second span is dead. The Seneca Casino downtown is morphed into a smaller project, sans hotel, that seeks to embrace businesses in the growing neighborhood. Canalside is poking along, and most citizens seem more interested in enjoying sunshine on the water and a new concert series than get worked up over a couple hundred grand to over-priced Fred Kent and company. The Medical Campus adds new buildings every couple months, and UB 2020 has passed in an abbreviated form; the ink had barely dried on Cuomo’s signature and already the silence was deafening from all sides, for and against. Even Benderson’s “lifestyle center” on Maple died with a whimper. 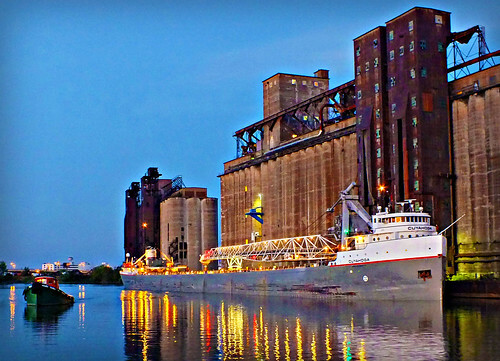 The next Silver Bullet checklist is currently being drawn up – for now it only includes new bridges across the Buffalo River to connect the Inner and Outer Harbors. Perhaps the collective bile will rise as new projects are added. Maybe it’s because the instigators have faded away, in victory, defeat or irrelevance. Paladino has mostly kept his turds out of punchbowls since his drubbing. Williams is out as Buffalo Schools Superintendent, Simpson is gone from UB, and Quinn from the ECHDC. I haven’t heard Tim Tielman’s name in months, and Goldman faded as quickly as the paint job on the Adirondack chairs. Esmonde took a (partial) buyout and no one except the insiders care if Lenihan follows the governor’s career advice or not. Maybe it’s because shoes have yet to drop. The HSBC pullout from Buffalo seemed inevitable earlier in the year. Now First Niagara has a branch network and hockey arena to its name, and the first round of global HSBC cuts have passed us by unscathed. The tower HSBC occupies is in danger of emptying (Phillips Lytle moving two blocks if nothing else), but the main leases there expire in several years. Maybe it’s because our political season is suddenly a snooze fest. Only six weeks out, Erie County residents may be excused for forgetting there is a County Executive race this November. In contrast to Senator Mark Grisanti’s race for a district that covers roughly the same territory, the recent special election to replace Sam Hoyt in the Assembly passed a week ago with barely a whisper. The local Tea Party groups stopped holding rallies at the waterfront, and no highway tolls are currently on the chopping block. We downsized our Erie County legislature with the help of a judge, and Maria Whyte finds herself stumping for upgrades to the county clerk’s office (Kathy Hochul presided over the Dark Ages?) instead of lighting evil fat cats on fire. We have a Governor who earns the begrudging respect of everyone in the room, and through pragmatic competent leadership, Albany’s tone has actually changed. Alan Bedenko’s coverage of petty politics in Clarence is as insightful as it is ordinary. A fascinating glimpse into crumb gathering to be sure, and effective at the ballot box, but the fish are so much smaller than what we’re used to. Maybe it’s because no one of the above really matters all that much. It was a beautiful summer, the Bills are 2-0 (and so is my fantasy football team), and Terry Pegula has Sabres fans walking in a perpetual blissful dream world. The worst of the catholic church closings have passed, there are more urban gardens every year, the roads are full of construction workers (read: jobs), and Gordon Biersch has landed at the Galleria. Small improvements, from Riverfest Park to Buffalo River dredging to three-story brownstone renovations all over the city, are quietly creating a swelling avalanche of pebble-sized bits of good news. So the Jersey Livery renovation hasn’t happened yet. Neither has the Wingate Hotel of Doom. No one is chaining themselves to piles of bricks to thwart the wrecking ball. Instead, orphanages that I considered lost causes are undergoing rehab in forgotten corners of the city. The Tonawanda Powertrain workers are back, and GM is dumping in nearly a billion in new investment. The Great Recession was bad in Buffalo, but our 7.6% unemployment rate and tiny housing price growth is the envy of the nation. Has this placated us? It’s not like every problem has gone away. We still have a caretaker, over-politicized mayor. We still have a shrinking population and blighted neighborhoods. A rash of industrial fires in residential neighborhoods have spurred the Clean Air Coalition of WNY to expose how little we know about air quality during major accidents. But I hear little generally from the activist community locally. I’m not being asked to attend rallies to save anything, stop anything, or make anyone change their mind. Why? What do you think? Has the tone changed or have I missed it? I look forward to input and comments.